Art Project Tatsuno was held for the second time this year. The project was subsidized by the Japanese Agency for Cultural Affairs as part of its efforts to promote tourism and regional activities based on local cultural heritage. We are grateful for the success of the event and would like to express our sincere appreciation to the many local residents and organizations who provided us with their enthusiastic support and assistance. In this project, contemporary art is displayed in old soy sauce warehouses and other traditional buildings, some of which have been remodeled or renovated, to convey the charm of Tatsuno and promote regional activity and international cultural exchange. 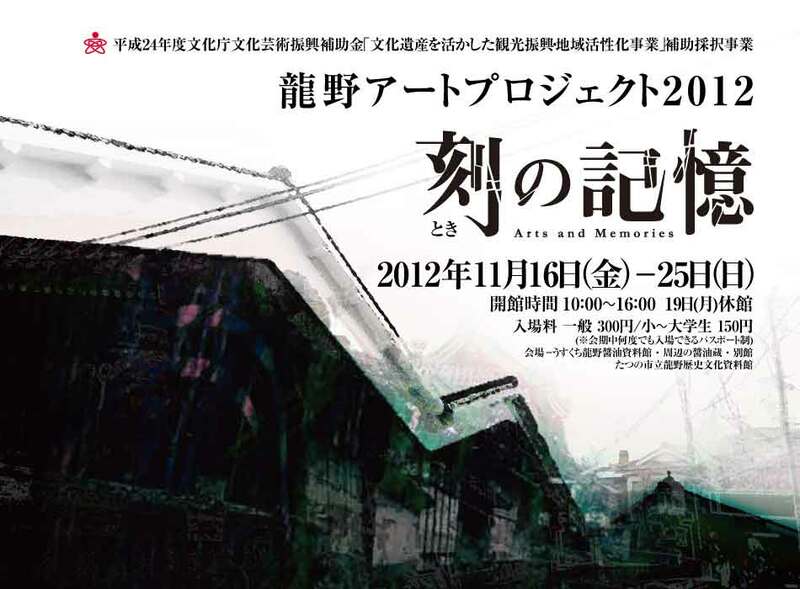 In the previous event, Art Tatsuno 2011 (held in November 2011), the spatial appeal of the buildings provided the artists with a special inspiration. Based on the theme of “Art and Memory,” the event gave rise to a natural harmony, elevating both the structures and the works, and creating a synergistic effect. Among the participants in this year’s exhibition, special mention should be made of the Japanese artist Takesada Matsutani, formerly of the Gutai group and currently based in France, who showed a selection of his two-dimensional works, some for the first time ever; the Madrid-based Toshiro Yamaguchi, who is celebrating his 30th anniversary as an artist; and Ryosuke Imamura, who oversaw the use of the warehouses and coordinated the marvelous exhibition with his keen spatial sensibility. Another notable aspect of the event was the collaborative work performed by the students of l’Ecole Supérieure d’Art et Design Le Havre-Rouen (ESADHaR) and young local artists as an extension of the friendly relationship they established last year. We are pleased that these efforts have helped enhance the appeal of contemporary art both in Japan and abroad. In this project, we made a special effort to appeal to a wide range of people, providing art lovers, local residents, and school-age children with the opportunity to appreciate contemporary art. To achieve this goal, we organized workshops for children and a stamp rally to link the town to the exhibition site, encouraging participants to discover historical sites from the past. We also held talk shows and guided tours. This year, in particular, the project was organized with the full cooperation of the local merchants’ association and the Environmental and Architectural Engineering Department at North Tatsuno Prefectural High School, whose students helped install the exhibition, and Tatsuno Prefectural High School, whose students helped organize the workshops and poetry recitals. It is a great pleasure to see that the project has become so deeply rooted in the local community. In closing, we would like to express our sincere appreciation to the artists and the many others who provided us with their support and assistance. Without them, this project could not have been possible.